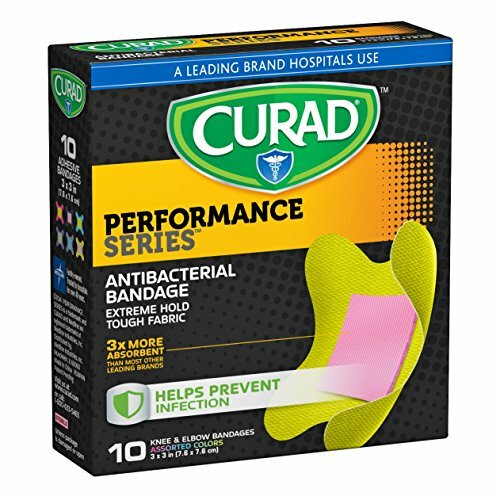 Hurry and get the Curad Performance Series Knee and Elbow Extreme Hold Antibacterial Fabric Bandages, 10 Count today for only $1.52 from Amazon when you subscribe to 5 or more items in the same month! There is no commitment with Subscribe & Save. You can cancel at any time! Plus, get free shipping!! Details here! Want it right now? You’ll pay only $1.79! Get FREE shipping (2-day for Amazon Prime members) when you purchase $25 or more of eligible items across any product category. At the game, the gym or on the trail, Curad Performance Series Bandages won’t quit. These bandages feature extreme hold adhesive technology. Tough, heavy duty fabric offers outstanding protection that is also breathable and flexible. The antibacterial wound pad material is three times more absorbent than most other leading brands and helps prevent infection. Not for use on delicate and sensitive skin. Buy the Curad Performance Series Knee and Elbow Extreme Hold Antibacterial Fabric Bandages, 10 Count from Amazon.